NOTE: Below is a list of players, who, effective July 1, became free agents. NOTE: This is the official free agent signings list as of July 1 at noon ET. Unfortunately for Colaiacovo, the business side took center stage with his career, and Friday he traded in his Blues jersey for a Red Wings model when the veteran unrestricted free-agent defenseman signed a two-year, $5 million contract with the Red Wings. ARLINGTON, Va. -- Washington Capitals general manager George McPhee has made a habit of signing his youngest players to short-term deals. Defenseman Karl Alzner, goalie Michal Neuvirth and center Mathieu Perreault all are working under two-year contracts, and it would have been easy for defenseman John Carlson to follow suit. The Capitals' 22-year-old blueliner bucked that trend Friday, agreeing to a six-year, $23.8 million contract. Carlson will earn $3.8 million in 2012-13 and $4 million per season from 2013-14 through 2017-18. Goaltender Ben Scrivens signed a two-year contract with the Toronto Maple Leafs on Wednesday. Scrivens is expected to serve as the backup to James Reimer to start this season. Scrivens, 26, split the 2011-12 season between the Maple Leafs and the American Hockey League's Toronto Marlies. The 6-foot-2, 192-pounder played 12 games for the Maple Leafs, registering a record of 4-5-2, a 3.13 goals-against average and a .903 save percentage. He made his NHL debut, recorded his first win and stopped 38 shots in the Leafs' 4-1 victory on Nov. 3 at Columbus. BROSSARD, Quebec -- When Max Pacioretty completed his breakout season with the Montreal Canadiens in April, he had no idea what the future had in store for him. The team was without a general manager at the time, Pierre Gauthier having been fired a couple of weeks earlier, and Pacioretty was about to enter the final year of his two-year, $3.25 million contract. "We felt he's part of our core moving forward. He showed character with what happened when he got hurt, he came back strong. The guy cares about the team and his teammates. We wanted to tie him up and we felt this was a good deal, and he felt the same way." But when Marc Bergevin was hired as GM at the beginning of May, Pacioretty's future became a lot clearer. Shortly after Bergevin was hired he began talks with Pacioretty to get his name on a long-term deal, a process that came to fruition Monday when he was signed to a six-year, $27 million contract extension that could keep the budding power forward in Montreal until the end of the 2018-19 season. "I wanted to do it at all times, but it's something that wasn't available with the old management situation," Pacioretty said Tuesday in a conference call, referring to Gauthier's reluctance to negotiate contract extensions with players who are not free agents. "I didn't really know what to expect for the future, I didn't know if the new GM was willing to negotiate mid-contract. As soon as they said they wanted to get a deal done, I love playing in Montreal and I wanted to get it done as soon as possible." TORONTO -- P.K. Subban wants to remain in Montreal, and despite the fact the restricted free agent defenseman is still without a contract for next season he remains optimistic he'll have a long career with the Canadiens. "There's no question that people know that I enjoy playing (in Montreal)," Subban told NHL.com on Monday during a visit at Laylor Performance Systems, where he trains in the summer. "I grew up a Montreal Canadiens fan. I love playing there and I want to play there for the rest of my career." Subban, who finished playing under his three-year entry-level contract last season, said because he doesn't know when a contract will get done with the Canadiens he's keeping his focus on his summer training. He would not divulge the terms he is seeking except to say "when you're comfortable in a place, everybody would like a long-term deal." Subban, 23, was making $875,000 per season under the terms of his entry-level contract, according to CapGeek. He has 76 points in 160 regular-season games along with 12 points in 21 postseason games. The Philadelphia Flyers announced Wednesday that they have re-signed defenseman Marc-Andre Bourdon to a multiyear contract extension and have inked center Scott Laughton to an entry-level contract. No financial terms were disclosed for either deal, but CSNPhilly.com says Bourdon's pact was for two years and $1.225 million, an average annual value of $612.500. Laughton was Philadelphia's first-round pick (No. 20 overall) in the 2012 NHL Draft. He spent the last two seasons with the Oshawa Generals of the Ontario Hockey League, producing 33 goals and 76 points in 127 games. 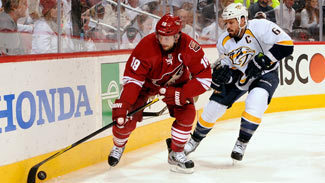 While free agent Shane Doan stays busy fielding contract offers and visiting teams, Greg Jamison, the prospective owner of the Phoenix Coyotes, is still trying to finalize an agreement to purchase the team from the National Hockey League. Since Doan, who has played his whole career with the Phoenix franchise, has tied his future in the desert to Jamison's ability to finalize a deal for the Coyotes, he remains the most coveted unrestricted free agent still on the market. The question is for how much longer? 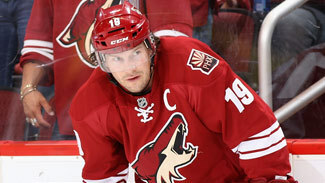 "I've made no bones about the fact that I want to go back to Phoenix if the situation works out," Doan, 35, said earlier this month while in New York attending the collective bargaining negotiations between the NHL and the National Hockey League Players' Association. "I understand at some point I'll have to probably make a decision without knowing all the information, but until I get as much information as I can, I'm going to try to wait." Doan's patience appears to be waning. Jamison still hasn't secured the team and it remains unclear when, or even if, he will. Meanwhile, Doan, who has played in Phoenix since the team arrived in 1996, has a wife and four school-aged children to consider, and if he is going to start playing in a new city, he wants to get them settled as soon as possible.